Book 4 in the Masterpiece Adventures chapter book series featuring Marvin the beetle and his best friend, James. James’s father, Karl, and Christina, his friend from the museum, are getting married! James is the ring bearer and he is excited but also nervous. He loves Christina yet he is worried about losing his dad to a different family and a different life. And what if, at the wedding, James drops the ring? His beetle best friend Marvin promises to help him, but Marvin ends up with an even more critical job when something goes wrong. Will the whole wedding be ruined? Not if Marvin and James and Elaine can help it. 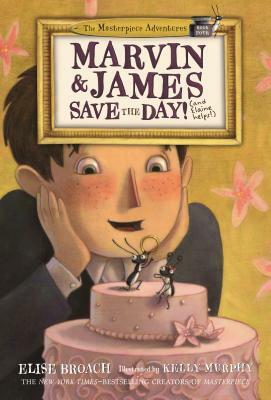 This young chapter book for emergent readers captures the miniature world and friendship of Marvin the beetle and James. Complete with charming illustrations on every page by Kelly Murphy. Elise Broach is the New York Times bestselling author of Masterpiece, Shakespeare’s Secret and Desert Crossing, Missing on Superstition Mountain, the first book in the Superstition Mountain Trilogy, as well as several picture books. Her books have been selected as ALA notable books, Junior Library Guild selections, a Publishers Weekly Best Children’s Book, a New York Public Library Best Book for the Teenage, an IRA Teacher’s Choice, an E.B. White Read Aloud Award, and nominated for an Edgar Award, among other distinctions. Ms. Broach holds undergraduate and graduate degrees in history from Yale University. She was born in Georgia and lives in the woods of rural Connecticut, walking distance from three farms, a library, a post office and two country stores. Kelly Murphy has illustrated many books for children including Masterpiece, Alex and the Amazing Time Machine, and the Nathaniel Fludd, Beastologist books. She lives in Providence, Rhode Island.